Why are the presenter notes ugly when I export them as PDFs from Keynote? I use Keynote and I like it. However like many other professional-grade products from Apple it seems to to be changing in ways that make it less suited to my needs. 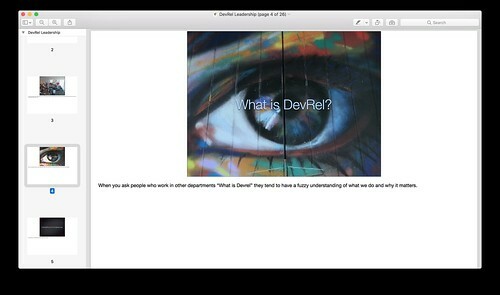 In Keynote 09 I can easily export a good looking PDF with presenter notes and upload it to Speakerdeck or Slideshare. In Keynote 7.3.1 that's no longer possible. All you can do is export a PDF with presenter notes that take up more than 50% of the page. Or you can export something decent-looking but it won't have presenter notes. There's an OpenRadar issue for it but it's been open since July 2015 and it still hasn't been fixed. That leaves people like me with a limited set of options. Go back to using Keynote 09. Use Keynote 7.3.1 then export to Keynote 09 format and from Keynote 09 export a PDF. Export a PDF without speaker notes and hope that people will wait for the video of your presentation to be available. Adopt Monica Dinculescu's approach where you change your slides after the presentation so that your speaker notes are part of each slide. People sometimes claim that the web and native apps are converging. I disagree. I think the process is more like chiasmus in the sense that we will end up with an app-like web and a web-like app ecosystem but they'll still be different from each other. The two ecosystems will cross over but the results will have surprising new capabilities and unlock new metaphors for thinking about them. In the meantime we are stuck in an uncanny valley where a lot of the PWAs people know are designed like Android apps rather than trying to be native to the web. One of my colleagues even wrote an article arguing that you should "start by forgetting everything you know about conventional web design, and instead imagine you’re actually designing a native app." That conceptual model would focus on the uniquely universal reach of the web rather than just what's possible on high-end mobile devices. That's because the first time the user visits your site may be on a desktop and if they get a bad experience they're not going to click on links to your site when they turn up in search results or in a social media context. Even if the first visit happens on a mobile device it may be a low end device or on a flakey network so if they get a bad experience there they definitely won't return in other contexts. What I'm saying is that the value of the web is reach. Adopting tools that make it harder to achieve reach works against you. That conceptual model would emphasise URLs, linking to other people's sites and reusing rather than reinventing browser features. 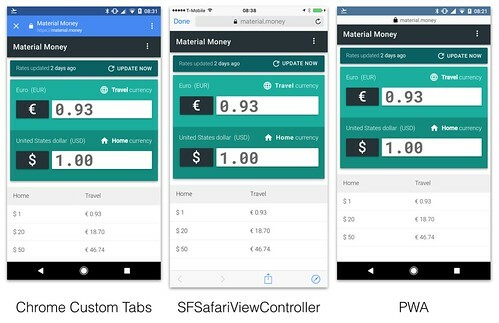 For example native apps get Chrome Custom Tabs or SFSafariViewController which are great experiences that encourage linking to the rest of the web. Consequently their developers don’t have to worry about harming retention metrics because it's just one click to get back. But we don't yet have the equivalent for PWAs. use the PRPL pattern to ensure the fastest possible initial experience. take advantage of PWA techniques and technologies to give the user the best possible experience. be responsive so that any user on any device can access the site and get a good experience. be progressively enhanced because the set of capabilities that will be available on the user's device are unknowable. link liberally and rely on the browser to provide features like sharing, window management and navigation. default to web-like design tropes and only make the effort to be app-like when it provides a clear benefit. focus on their own branding (whilst still being responsive to the constraints of the user's context) rather than trying to fit into any given operating system's guidelines. the nature of your traffic. If you depend on traffic from external links, have high bounce rates and low session-depth then you should be leaning towards PWS. If you have lots of direct traffic, low bounce rates and high session-depth then you should be leaning towards a PWA. the amount of resources you're willing to invest. The less resource-constrained you are the more you should skew towards a PWA. the incremental ROI: If your incremental ROI is small then it doesn't make sense to invest a lot. Given that a PWA is a bigger investment than a PWS you should default to PWS and only make the extra investment to build a PWA if you can clearly articulate the additional benefits you'll get from it. I recently saw this article in SD Times by Frank J. Ohlhorst which was describing the PWA approach to a new audience. Whilst I'm glad that Frank wrote the article I felt it had a few significant technical inaccuracies or misunderstandings. It initially starts strong with lots of elements taken from Alex Russell's original blog post. The author then correctly points out that Alex's post didn't tell people about the app shell model or explain service workers. Then he makes a few errors. Firstly PWAs don't work like websites, they are websites. As a result they don't require frameworks. Here's the code to a PWA: https://github.com/GoogleChrome/gulliver that was built without using a framework. And this is Huffduffer. It's one of my favourite PWAs. It also doesn't use any frameworks. That doesn't mean I think frameworks are bad. Just that whilst frameworks and libraries can help with building great web experiences (like my favourite interface to Hacker News) they're not essential. Another misunderstanding is the claim that PWAs can't support single-sign-on and cross-application logins because "PWAs are unable to independently collect and store that login information." This is incorrect. PWAs like Google+ already support single-sign-on. Try visiting it in an incognito window, signing-in then visiting another Google property. You'll stay signed in. This is possible because PWAs are just websites. Another misunderstanding is the idea that PWAs lack hardware support. PWAs are only limited to the hardware features that browsers can access on each platform. Since browsers are just native apps like any other the true constraints are in the APIs they choose to expose to web sites. That means cameras are supported and so is GPS and so are biometrics. You can try the latter in Stripe's Apple Pay demo. There are certainly caveats that should be applied. For instance many of the web APIs for hardware aren't standardised or aren't available in all mainstream modern browsers or aren't as good as the equivalent native APIs. Many of them also don't iterate as fast as the equivalent native APIs. At the same large numbers of people use these capabilities every day in web apps like Facebook, Instagram and Google Maps. Finally there's a misunderstanding of Safari's support for PWAs. It's true that Safari currently doesn't support Service Workers or web app manifests or push notifications but that misses the point of PWAs. The P stands for progressive as in progressive enhancement. That means that a good PWA will still be a good experience on Safari but will be progressively enhanced to be a better experience on browsers that have more features. 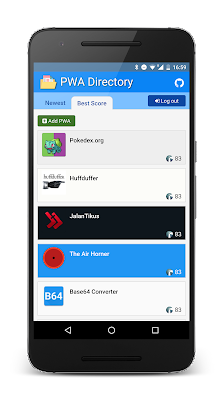 I'm biased since my team at Google built it but I think that a great resource for looking at hundreds of examples of PWAs is our PWA Directory. I would also suggest that people take a look at our PWA Checklist and my colleague Owen Campbell-Moore's Google I/O 2017 talk to get some tips on how to build a great PWA. As a publisher you have 2 choices. You can either bring the people to your content or you can find ways for your content to flow towards the people. Historically that has meant using syndication technologies like RSS but in these days of #PeakRSS that's no longer sufficient. The audience are no longer just sitting in front of their aggregators. They're sitting in front of activity streams watching reshares and hitting reload on their favourite websites every morning. To maximise the reach of your content you have to reduce the accidental friction (see Brooks on the difference between essential and accidental properties) involved in sharing to those activity streams. That means making it easy to share (hence the sharing buttons all over the web), making it clear why they should share (hence the various experiments encouraging you to share or tweet specific quotes from an article) and finally making the shareable unit something that can travel easily around the web. This is where embeds come in. An embed is a card that contains a chunk of a site's functionality that can be ripped out of that site and reused elsewhere. This can range from music players (like Soundcloud) to video players (like YouTube) to quotes (like Twitter) to whole discussion threads (like Google+). What distinguishes them from glorified screenshots or Xanadu's transclusions is their interactivity. Visitors to your site can interact with this foreign content without abandoning your site. Ultimately publishers will realise that embeds are just the first generation of portable content unit and they have their own limits. There will be other generations and they can offer different trade-offs. What if there are interesting things waiting to be discovered where artificial intelligence meets art? At Google I/O 2016 Ramzi Rizk told me there's a field called Computational Aesthetics. It is so nascent that it doesn't even have a Wikipedia page. Computational Aesthetics is where computers can actually tell us if a picture is pretty or not. This is different from systems like Flickr's Interestingness because the system infers beauty from the image itself rather than from the social signals generated by people's interactions with the image. In fact there's already been research showing that social signals lead communities like Flickr to overlook hidden gems. This research raises the tantalising possibility that there may be large numbers of overlooked masterpieces hiding in the historical corpus of art. I find this intersection of art and machine learning interesting because at scale it leads to the discovery of new tools and new perspectives on something that we consider to be uniquely human. For example the spatial visualisation used in the "Machine learning & art" talk at I/O lead me to t-SNE as a mechanism for building two-dimensional maps of high-dimensional spaces. 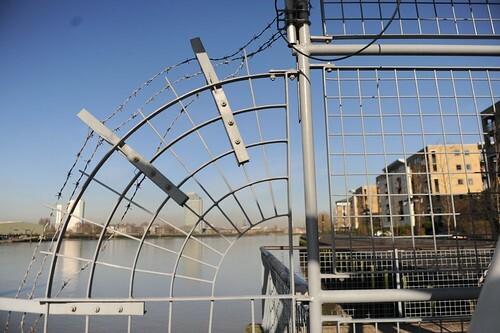 This raises the possibility of building pirate maps of information spaces or hypertexts and connecting that to Vannevar Bush's ideas about stigmergy in the Memex. Imagine being able to create and share your own trail through the space of all art? Or being able to reinvent the idea of the traditional slideshow of the family's holiday photos. Today apps like Prisma merely help us make alternative versions of existing photos. At the same time apps like The Roll and Google Photos help us identify our best photos. In the future they might help photographers to create photos from scratch and tell new kinds of hypertextual stories. give an obvious place to find apps that have particular functionality (try searching for "games that don't need wifi" in the Play Store). Do you remember how painful native mobile apps were (for users and developers) before the popularity of app stores? 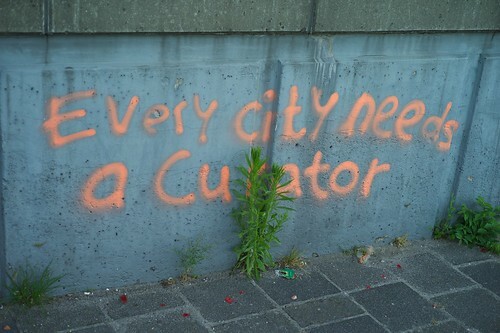 a plurality of voices and projects pushing the web forwards. a mechanism where submitting a PWA is as easy as providing a URL therefore anyone can do it. a mechanism where web sites and web apps don't have to provide anything proprietary in order to have a chance of being featured. to build upon the lessons learned from Mozilla's Firefox Marketplace and Chrome's Web Store. something that feels like it's part of the hypertextual web of links rather than a poor copy of native app stores. Instead of 'cargo culting' the app stores we should be asking what web-centric solutions to the problem would look like. For me that means lots of competing and opinionated PWA directories rather than one central PWA Store or even a popular search engine.